Sony’s venture into the world of basketball keeps getting worse and worse and the latest title, “NBA 09: The Inside” is absolutely no exception. The shallow, unrealistic and far-behind design of Sony’s NBA venture is back for yet another round and this time, there’s even more junk in the mix! 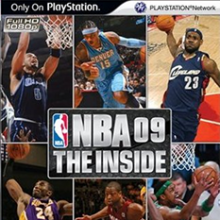 All of your most hated design flaws make a triumphant return and I know you just can’t contain yourself, so without farther delay, I present to you my review of “NBA 09: The Inside”. Sports games have never been know for any spectacular sort of visual appeal, but for a next-gen game, “NBA 09: The Inside” really should be more polished than it turned out. Everything just looks so artificial. Animations are the total opposite of lifelike. To Sony’s credit, though, the lighting is spectacular and the audience is very active; far more so by comparison to the other basketball titles this year. The soundtrack is okay, the audience is lively and the announcers are standard fare, but really, nothing sound-wise stands out here. The best part here would be the announcers, which are a very mixed and seemingly random bag and range from really repetitious to varied and realistic. Gameplay is where this game serious lacks any sort of substance. Yes, it’s basketball and yes, it’s still fun to play, but there aren’t many modes worth playing and no one plays online at all. The list of modes includes The Life, Franchise, Quick Play and various minigames. The entire game is as generic as they come and the minigames are virtually pointless because once you’ve played each of them once, there’s no reason to ever come back to them. The trade system is dumbed down by comparison to other games on the market and what’s more, the roster updates are far behind in terms of technology and quite lacking. The career mode, titled “The Life” is a very bland and basic mode that feels more like a series of matches with a lame tacked-on story and does nothing to immerse players whatsoever. The only thing this game has going for it is the extremely tight controls and even those don’t work right half the time, considering the defensive abilities seem to be quite lacking in this game. There’s a lot of bad things to be said about this game, but in short, it’s terrible and there’s virtually no reason to buy it. Overall, I feel that Sony should bail out of the sports game competition and leave it to the devs who know what they’re doing. There’s basically no reason to buy this game. Stick to one of the other 2 NBA game series.